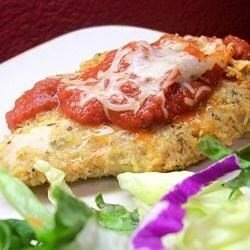 "This is a favorite around our house; it's quick, easy and tastes great! This is a recipe that I came up with; measurements can be varied depending on your taste, i.e. if you want more cheese add more cheese, if you want less use less, you really can't hurt it. And you really can't mess it up as long as you use this recipe as a foundation." In a medium bowl mix together the bread crumbs, Italian seasoning and Parmesan cheese. Dip chicken breasts in egg, then in bread crumb mixture to coat. Place coated chicken in a 9x13 inch baking dish. Bake in the preheated oven for 30 to 35 minutes or until juices run clear, turning over chicken 5 minutes before removing from oven. Hint: It’s all about the cheese! Very tasty chicken. A little crispy on the outside, moist and juicy on the instead. Served it with fettucine and Quick and Easy Alfredo Sauce from this site. Yummy.